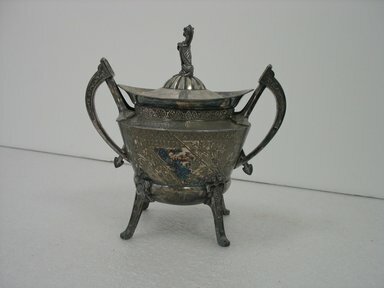 Sugar bowl decorated in hybrid Aesthetic Movement and Neo-Grec style. Cylindrical body that tapers towards base raised on flared legs. Flat, sharp shoulder with short neck and flared rim. Applied laterally opposed curved handles. Ribbed dome lid with seated lion finial. Variegated polished and matte finish and stippled decoration in asymmetrical Japanese-inspired decoration in variegated finish of shiny and stippled decoration. On body, diagonal engraved reserves of bamboo articulated with saw-tooth and diamond patterns. Neck molded with conventionalized eight-petal floral band. Hieroglyphic-like shapes molded on either side of curved handles. Molded boat image on thumb pieces.